Roger was three years old when his family first discovered his early talent for playing drums. At four, he sat in with the Tab Smith Big Band. His uncle Frank Humphries was working with the Tab Smith Band along with Savannah Churchill and welcomed young Roger to the bandstand. He began playing professionally at the age of fourteen. He led his own group at Carnegie Music Hall at sixteen. “I’ve had a love for music as long as I can remember.” Roger was encouraged by his older brothers Lawrence Jr. and Norman, also musicians. Roger recorded three albums while working with Horace Silver; “Song For My Father”, “Cape Verderan Blues” and “Jody Grind”. Song For My Father album is one of the most prolific albums of all time, still being played by most jazz radio station as a popular hit. His tenure with the great Horace Silver lasted a little over three years from 1964 through 1967. While recording those three albums, he played with such giants as Joe Henderson, James Spalding, Tyrone Washington saxophone, Teddy Smith, Larry Ridley bass, Woody Shaw, Carmell Jones and J.J. Johnson. In 1965 Roger recorded with the great trumpeter Carmell Jones on the album,”Jay Hawk Talk”. Shortly after leaving Silver, Roger began working with Ray Charles. This was his first experience working with a Big Band. With Ray, he toured Europe and various cities throughout the country. Roger performed at the Coconut Grove in Los Angeles and the Newport Jazz Festival. Roger has kept the beat on so many recordings such artists as Geri Alan, Herbie Mann/Phil Woods, Richard “Groove” Holmes, Kenny Blake, Frank Cunimondo, Dwayne Dolphin and Nancy Wilson’s 2004 Christmas album. He also appeared on Oprah Winfrey and Bryant Gumbel TV show with Nancy Wilson. In January of 1980, Roger toured Europe with organist Richard “Groove” Holmes and tenor saxophonist Willis Jackson. During this tour, Roger performed in France, Spain, and Holland. An album was also recorded with the Black and Blue Record Company. After playing with various groups around the country, ace drummer Roger Humphries decided to organize his own group in 1972 which he calls RH Factor. In 1996, he assembled Roger Humphries’ Big Band. Roger gives special thanks to Dr. Harry Clark, principal of The Pittsburgh High School for the Creative and Performing Arts (CAPA) who allowed him to have such a beautiful experience teaching the students at the school. Dr. Nathan Davis gave him an opportunity to teach and share experiences with students at the University of Pittsburgh. Roger has influenced the careers of thousands of students and musicians also through participation in clinics and workshops around the country. Now retired from teaching in schools, Roger Humphries has held an annual Jazz and Blues Scholarship Boat Ride every year, giving thousands of dollars to young, aspiring college students studying jazz for decades. He and his wife Regina pay for this event themselves. In addition, he has led a weekly jam session, inviting musicians to hone their skills on the bandstand, and like he is known to say on the microphone, “This ain’t no Gong Show!”. Trumpeter, Sean Jones even penned a song by this name in honor of Roger! Students and musicians know to bring their best when joining Roger Humphries on the bandstand. On February 23, 2008 the state of Pennsylvania and the city of Pittsburgh issued a proclamation as Roger Humphries Day. He was given a certificate of recognition for his legendary performance in the field of music and teaching. 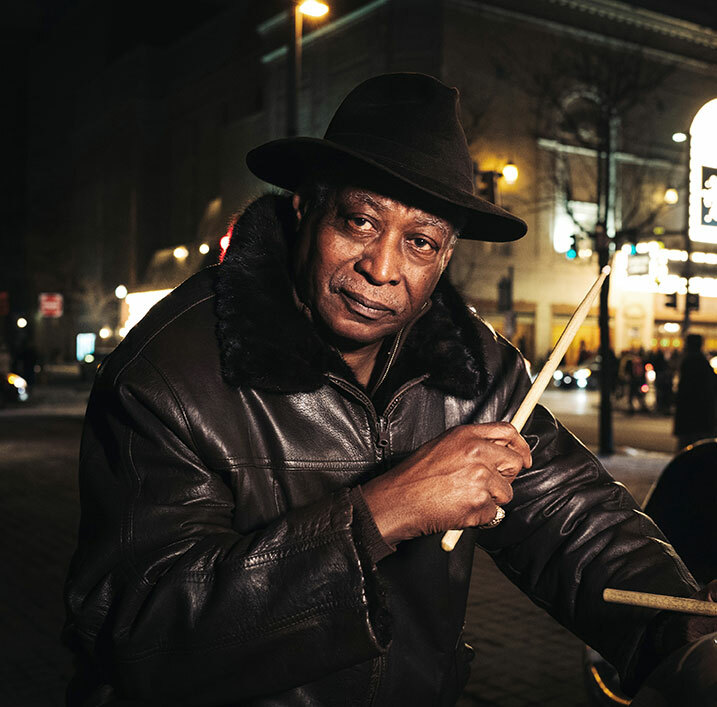 Roger Humphries is still going strong, still one of the most powerful drummers in the world, and lives in Pittsburgh, Pennsylvania with his wife. He is a loving husband, father and doting grandfather to a large loving family. Roger Humphries is truly a living legend, and an example of how jazz is life, pure, authentic and powerful.